Ever since I saw Jaws in the theatre at the age of eight, I have been transfixed by the power, mystery and timeless beauty of sharks. 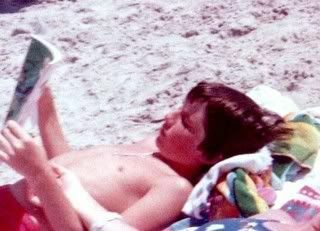 As a boy, I even used to bring a shark encyclopedia to the beach with me, hoping to spot a dorsal I could identify. Throughout my teen years, I spent the majority of my summer kneeboarding in Barnegat Bay, NJ. As I lay on the board in the water waiting for the boat to take off, each time I would imagine a bone-crushing jaw clamp on my ankle or knee. Friends of mine could attest that aside from Jimi Hendrix, my main subject to geek out on is sharks. They avoid this topic as they know I will blather on ad infinitum about sharks evolutionarily perfected predation techniques and various shark attack folklore while crowbarring in terms like ampullae of Lorenzini and sometimes even some Latin before reaching exhaustion. Its not meant to impress - as I am aware that most people eventually glaze over as I happily babble on - rather its an expurgatory venting as a need to understand and control my subconscious fears. Sharks pervade my nightmares. If Im ever floating in water in my dreams, there is always a daunting unseen presence nearby. The intent is not always manifested, but the fear is invariably palpable. My nightmares came to a head shortly after 9/11 when I battered a dreamshark with a kneeboard and screamed Youre not helping things! I worry about mans relationship with sharks and our paranoid need to destroy that which invokes fear. Fear can be empowering if processed properly. I used to enjoy Shark Week on Discovery Channel, but it is depressing be reminded about the dwindling Great White population (now down to 3,500). The harmless, endangered whale shark is even hunted in the Philippines, India and Taiwan. When it comes to shark literature, I usually opt for non-fiction, such as In Harms Way by Doug Stanton, Twelve Days of Terror: A Definitive Investigation of the 1916 New Jersey Shark Attacks by Richard G. Fernicola, Shark Attack by H. David Baldridge, SHARK: Silent Hunters of the Deep edited by Readers Digest, and the lurid but riveting The Jaws of Death: Sharks as Predator, Man as Prey by Xavier Maniguet. I havent read a fictional shark book since I read Jaws in the seventies. Even when I tried reading Close to Shore by Mike Capuzzo (a fictionalized account of the 1916 NJ shark attacks), I found it to be hamhandedly conjecturous and traded it in for Twelve Days of Terror. So when Steve Altens MEG: HELLS AQUARIUM arrived in the mail, I approached with ichthyphiles heightened expectations and skepticism. 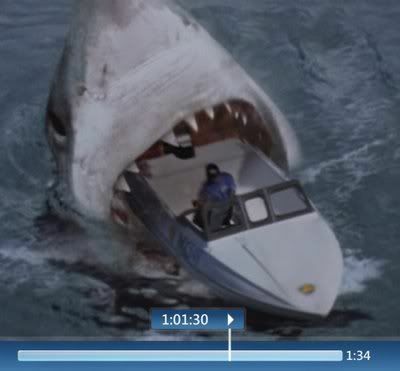 I once tried to write a story about a Megalodon attack when I was in 7th grade, but the size differential seemed calorically uneconomical for the shark. I also couldnt imagine a greyhound bus sized animal sneaking up on a bather. Steve Altens deft mastery of sharklore weaving and vast knowledge of the subject makes this all too imaginable. 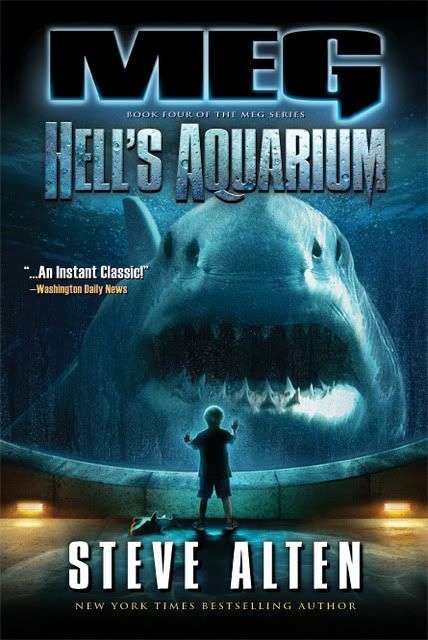 HELLS AQUARIUM begins with a detailed history of the formation of the Pacific Ocean, with a brilliant re-imagining of the prehistoric Panthalassa Sea being subducted under the Phillipine Sea during the continental reconfiguration. Within the subterranean sea are volcanic plumes that heat the water that have sustained life for millions of years, some of the life very large and bitey. We also learn that Megalodons, the Great Whites bus-sized ancestors, are not only predators in this underworld, but also occasionally fall prey to the much larger and agile Pleisosaur. We are then introduced to the Taylor family, who own and operate the Tanaka Oceanographic Institute in Monterey, California. It is host to a Megalodon family and has Seaworld-type shows for audiences. We also learn that there is a radical animal rights group called R.A.W. (Return Animals to the Wild) trying to strong-arm the Taylors into releasing the Megs. Also, there are representatives from Dubai interested in adopting two of the Meg offspring for their massive aquarium but also wish David Taylor to come train submersible pilots to capture some more critters from Panthalassa. The book balances the three plotlines in a brisk, present-tense pace. Action shifts from plot to plot as the others spool up for an enjoyable bloodfest in almost every chapter. Its rather difficult to become emotionally invested in the humans and their disposable personalities and conflicting convictions, which makes it easier to focus on the sea beasts and relish in their carnage. The animal rights group R.A.W. is apparently only in it for notoriety and money with which to line their faux fur pockets. The group features a cameo by Lana Wood (sister of Natalie), as their celebrity spokesperson. (Lana apparently a fan of the MEG series and was honored to be included). This is of course the usual manner in which to alienate the reader from the villain. However, the Taylor family, who are supposedly protecting the world from the Megs and the Megs from the world, are somewhat inept at handling them and leave a quite a few dead humans and Megs in their wake. The shady sheiks are of course duplicitous, and lure David into helping them with a hottie sub navigator as bait. An aspect of the book that I enjoyed most (aside from the carnage) is Altens careful attention to details. The intricacies of the submersible technology, the ostentatious opulence of Dubai, and the behavior, habitat and appearance of the creatures are meticulously described and brought to life. As a child, I was for some reason non-plussed by (non-shark) dinosaurs. I guess I always felt that we know so little about them and that most of what we read about them is guesswork. For that reason, the Kronosaurs and Pleisosaurs failed to grab me the same way the Megs did. Admittedly they are bigger, more dexterous than the Megs but I couldnt help but wonder if such a strange environment as a subterranean sea heated by volcanic plumes in which to evolve would yield stranger, Lovecraftian monstrosities than the ones we see CGIed on the Discovery Channel. The world of Panthalassa was after all not built in a Petri dish like Jurassic Park. Back in 2003, while I was sitting in the basement of the Angelica Theatre in Manhattan waiting for Chris Kentis' film Open Water to begin, a nervous guy sitting next to me apologized in advance for his jumpiness, explaining that movies like this made him nervous. I looked sympathetically at his embarrassed date and said with the paternal calm of a hostage negotiator/acid trip guide, "Remember, sharks are the real heroes. We are the enemy; just root for the sharks." This either comforted or disturbed him enough to leave me alone. If I might suggest as a finale for the Meg series - a sudden plate shift causes the floor of the Panthalassa to upheave its contents into the Pacific. 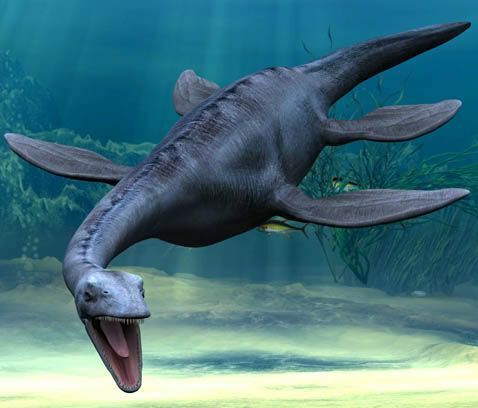 A mid-oceanic mega-tsunami floods the earth, and a hellish menagerie of Megalodons, Kronosaurs, Helicoprions, Lipleurodons and Pleiosaurs, etc. devour people like seagulls picking off sandcrabs on a beach. It would be a suitable ending for a parasitic infestation like humankind.